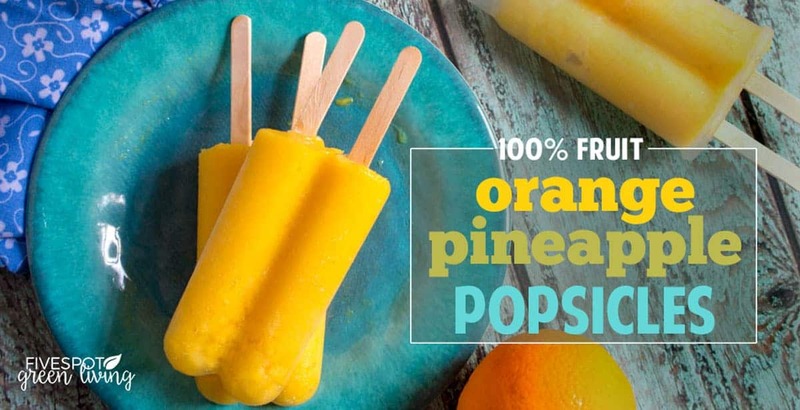 Here’s a light and refreshing orange pineapple popsicle recipe you can make this summer for your kids that won’t load them up with sugar! This is one of those healthy recipes your family will never believe has no added sugar! 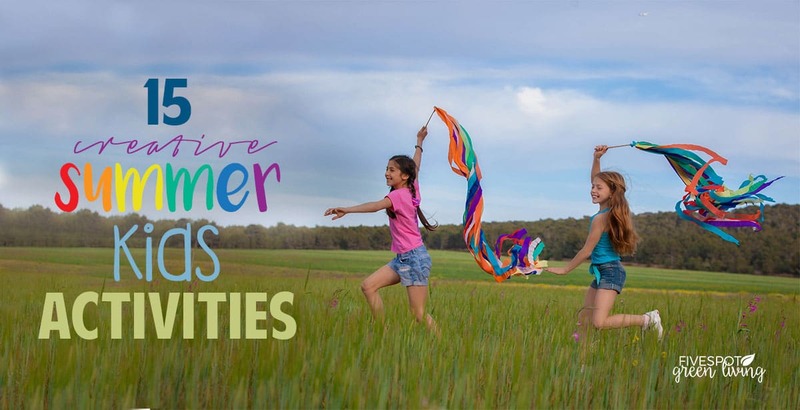 Do your kids like popsicles during the summer? Who am I kidding – what kid doesn’t like fruity icy popsicles? I always buy my kids the popsicles that are made with juice but that’s still a lot of sugar. 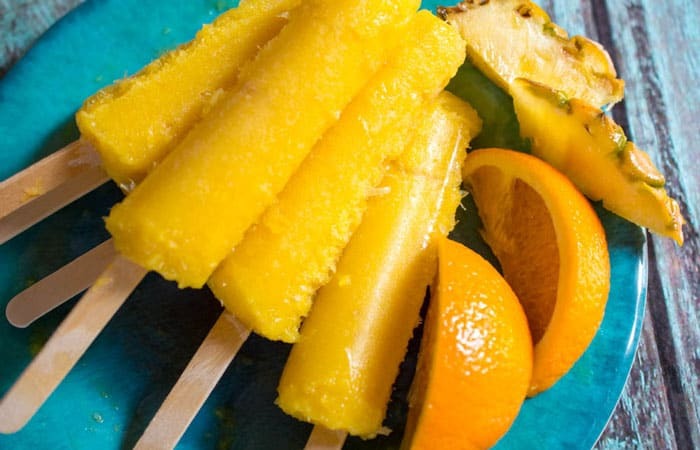 How awesome would it be to use seasonal fruit and make your kids a Refreshing Orange Pineapple Popsicle Recipe? 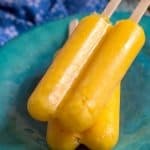 I like to use a blender to make these pops nice and smooth – I’m not one for chunks of fruit in my treats. But you can make them as chunky as you’d like. 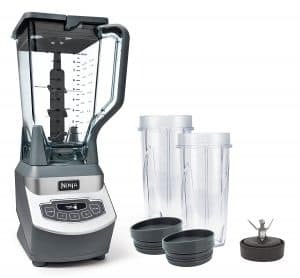 Personally, I like using my ninja blender to make the fruit smooth. 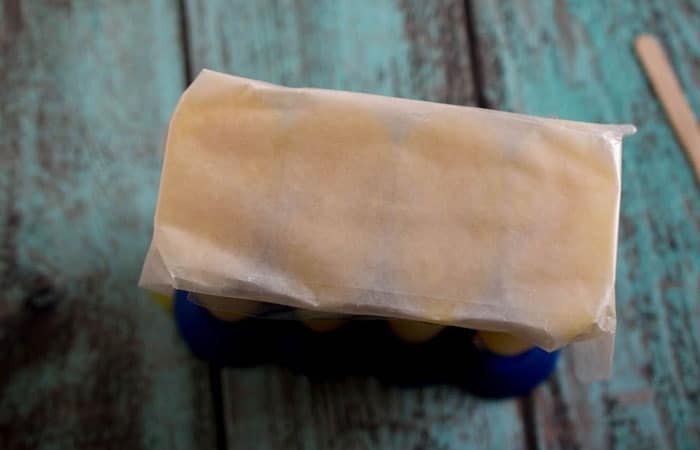 If there are any chunks leftover, you can either skim them out of the mixture or add them to the popsicle mold. My kids LOVE the fruit chunks! If you want to use wooden sticks, check out the hack below! 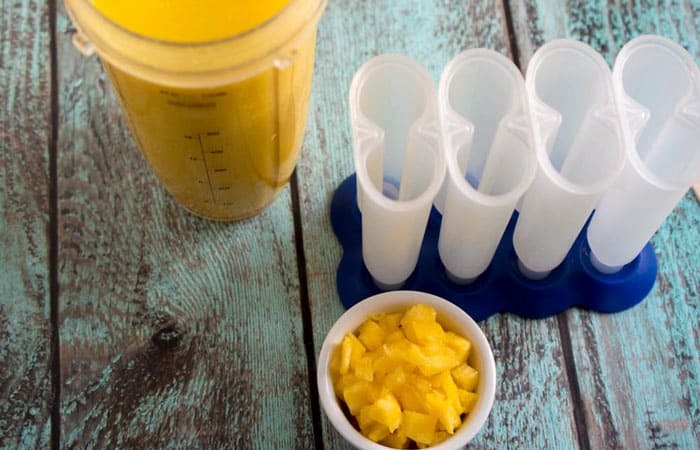 This recipe makes enough to fill TWO of the Tovolo Popsicle Molds, pictured here. Did your junk drawer eat the popsicle sticks that came with the mold? No problem! After you fill the molds, just get a sheet of waxed paper and fold it over 3 times and place over the top of the molds. Tape around the edges to keep it down. 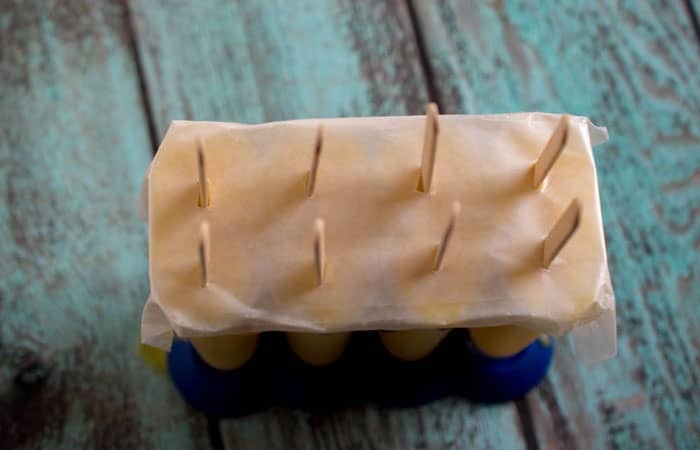 Use a knife with a small pointed tip and pierce through the middle of the wax over each popsicle mold. Insert wooden sticks and you are ready to go! 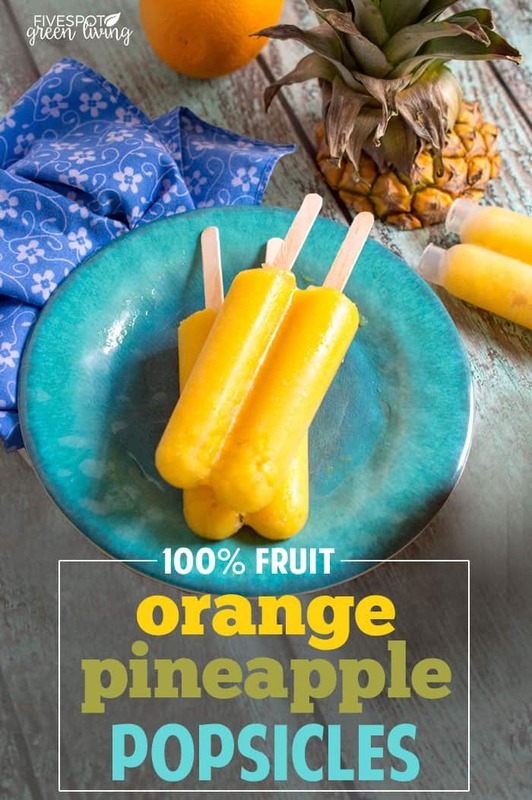 I love that you use fresh fruit to make these popsicles. I may share with the kids, but I am making these for myself!!! Thank you for sharing at Over the Moon. These look so refreshing. I would love one right now. It is a healthy way to eat fruit. Are you getting the intense heat in your part of New England? I’m pinning this recipe. My family will love it! Oh my yes Michele! Thank goodness it seems to have passed for now. It’s just so easy! Thanks for sharing at the What’s for Dinner Party. Love this idea! Thanks for sharing at the To Grandma’s House We Go DIY, Crafts, Recipes and More Wednesday Link Party! Pinned! Okay, I am definitely going to be making these. I love that it’s literally two ingredients. Pinned and will be featuring this on this week’s MM. Erlene – they are so super easy! Unbelievable. Love real snacks & treats.